Enrollment in The Alpine Club is automatic with your current email and mailing address. Please confirm with a cashier that your information is correct. Earn 5% in Bonus Bucks rewards for gear, clothing, and accessories purchased anytime October 1, 2018 through March 1, 2019. Bonus Bucks are earned for all non-Clearance items, and excludes Rentals, Shop services, Boot Lab services, Lift Tickets, Movie tickets, and Gift Cards. Rewards certificates are mailed at the end of each month, and you’ll receive your first rewards after you’ve reached $400 in qualifying purchases. After your first rewards certificate, your rewards will be sent to you after you reach $200 or more in qualified sales any following month. Bonus Bucks can be used to purchase any in-store merchandise, and excludes Rentals, Shop services, Boot Lab services, Lift Tickets, Movie tickets, and Gift Cards. 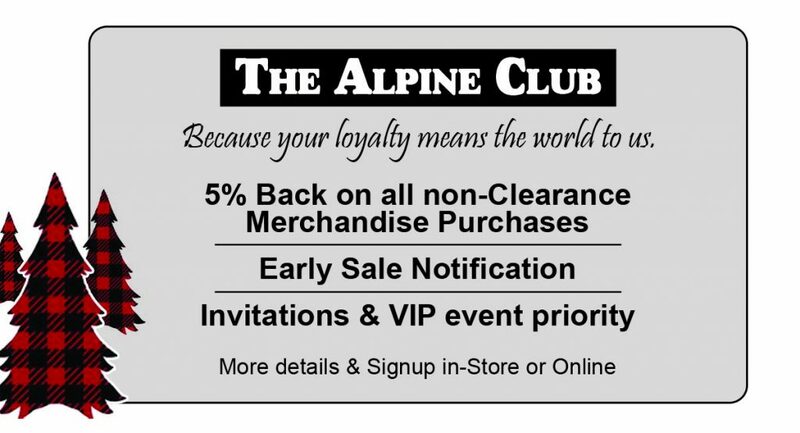 Come in to the store today to confirm your Alpine Club contact information and start earning Bonus Bucks rewards!